For many years, copper has been one of the best economic commodity indicators because of its ability to serve as an indicator for various economic trends and equity markets. That shouldn’t be too big of a surprise, since for many years, there has been a strong correlation between economic growth and the demand for copper. But is this still true? 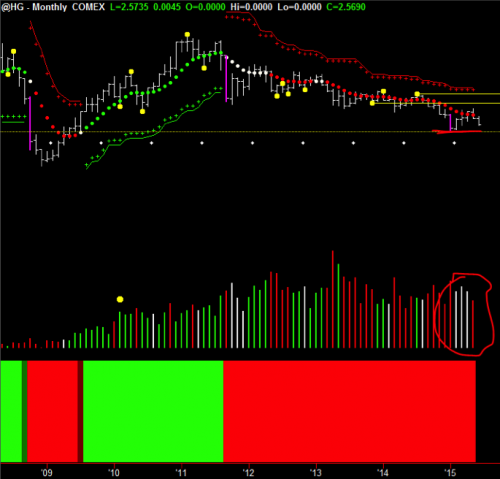 And what does our Hawkeye Trading methodology see in these charts? Even if you don’t trade commodities like copper, there’s an interesting lesson to be learned here. Based on the monthly chart below, copper has been in a down trend from the middle of 2012, and there is nothing stopping this move down. Notice how I have circled the volume in the lower right corner, and how last month put another red volume bar in. Also, notice how we have 50% of a Hawkeye Pivot being formed at the live edge of the market. If this month closes down, we will get a full Hawkeye Pivot at the top, which should be enough to push this market back down through the red horizontal line. And, as soon as it pushes down through that, we will come out of our congestion and push ourselves down again. So, a close under 2.4060 on the monthly is extremely bearish for this commodity. Now, let’s look at the weekly chart, as it is telling us a similar story. 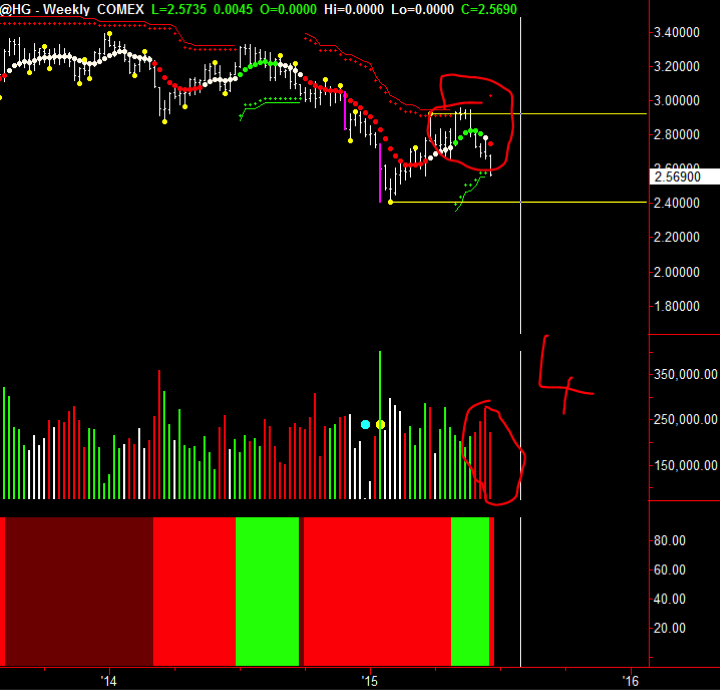 Notice how I have circled the volume and how we’ve now had four weeks of bearish volume. Also, notice how the Hawkeye Heat Map has gone bright red showing a downtrend has come in. And finally, at the end of this week, how a new trend to the down side has been put in, and how this market has rolled over. However, the Hawkeye weekly Pivot is at the same price point I gave you on the monthly chart (shown by the horizontal yellow line at the bottom). That has to be broken as well, and I would expect some resistance there. Finally, if we look at the daily chart, we can see that, yet again, volume showed four days before prices dropped that selling was taking place. 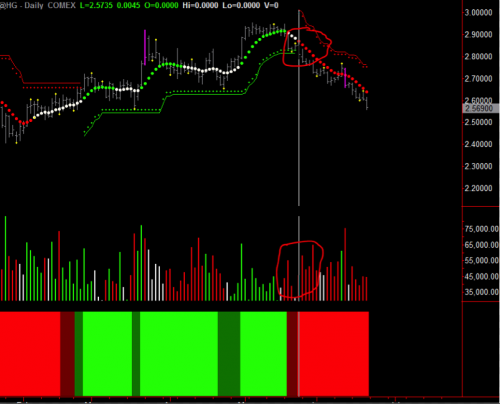 The Trend dot had rolled over, the volume is red (circled at the bottom), and the Hawkeye Trend dots at the top are showing that this reversal of an uptrend had taken place. Also, if you look to the left of the chart (before my red circle), you can see that the price just went sideways, and the Trend dot went flat showing you that distribution was taking place, which was confirmed by the volume. So in summary, Hawkeye is showing you that copper is bearish, which in turn means that the industrial world doesn’t want copper. That’s because we’re not on a building boom or in a tech boom at the moment. Because of this, we would expect to see more slides in the manufacturing stocks and particularly the Shanghai index.